All skilled workers from outside the EU will have to learn English before they can enter Britain, the prime minister is expected to confirm. 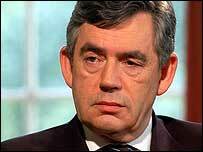 Gordon Brown will announce the measure at the TUC conference on Monday. The government estimates 35,000 of the 95,000 skilled migrants who entered the UK last year would not have been able to show they could speak the language. The British Chambers of Commerce said it was concerned the measure would put workers off coming to the UK. Director general David Frost said: "In recent years, migrant workers to the UK have ensured the continued growth of the economy, possessing a work ethic and skill level that many young British people just do not have. "Of course language skills are important, but I would be concerned if this meant that those who want to work and help our economy grow are kept out of the country and take their skills and talent elsewhere." But Home Secretary Jacqui Smith told BBC One's Sunday AM : "One of the ways in which I think we can make sure that people integrate more quickly... is by expecting people who are coming here through the skilled - and slightly less-skilled route - to actually be able to speak English." Exemptions will include international footballers signed by Premiership clubs. At present, only workers in the "highly skilled" category need to demonstrate that they can speak English before they are given permission to work in the UK. The test will now apply to the "skilled" category - and ministers have said they are looking to extend the requirement to low-skilled workers, who do not have the right to apply for permanent residency. Skilled workers will now be expected to understand English to a standard equal to GCSE grade A to C, it is understood. But Conservative immigration spokesman Damian Green said: "This will be a relatively minor measure unless it leads to a cut in the numbers of people coming here. "The Conservatives would impose a specific annual limit which would be significantly lower than current levels of immigration." Brendan Barber, general secretary of the TUC, said many immigrant workers suffered disadvantages from not speaking English. They needed help to learn their rights and to protect them from "unscrupulous" employers, he added. What happened to social Europe?